Learn to Sail is the perfect partner for anyone new to dinghy sailing. A jargon free approach and step by step guidance takes you through everything you need to know, and is designed to help you to get out on the water with the minimum of fuss. In this enhanced eBook, not only will you benefit from expert advice and hundreds of photographs covering all aspects of dinghy sailing - there are also 11 supplementary videos (viewable on suitable devices) showing you how to put the theory into practice. On-board and mast-head cameras give a uniquely helpful perspective. Videos include: *Essential knots *The racing rules *Reefing *Key factors *Beach launch *Pontoon launch *Capsize recovery *First sail *Tacking *Gybing *Spinnaker Not only are one and two--person dinghies covered, there are even tips on flying colourful downwind sails. The basic structure of national dinghy sailing courses is followed, though the emphasis is on keeping it simple and ensuring everyone has fun. 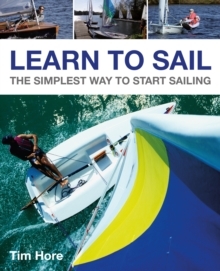 Learn to Sail is the simplest way to start sailing.